Before the first slots were officially patented, there were some occasions that were the starting point of the slot machine history the way we know it nowadays. The matter is that notwithstanding the fact that the father of slot machines the way we know them in modern world was considered to be Charles Fey with his Liberty Bell, the very first apparatus was invented more occasionally rather than on purpose by the American company. 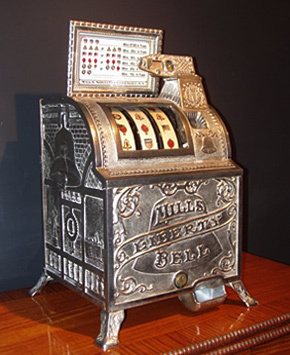 Thus, the company called Sittman and Pitt located in Brooklyn, in New York City of the USA managed to develop the particular gambling machine in 1891. This very machine was to become the precursor of the slots in the modern meaning of the word. Modern slot machines are very different by size, number of reels and payouts. Still the most common features remain the same over the years. However, the invention of the company was the beginning of the great slots history that further was to grow into the history of the world's most famous gambling. The invention of slots astonished the publicity and increased the amount of the gamblers all over the world. From the very beginning it was obvious that the magic mechanism could not possibly vanish, but was to be approved and officially patented by a person later on called the father of the slots. Approved and officially patented by Charles Fey - Father of Slots! The first slot machines can still be found on pictures and in some casinos in Vegas. The machine created by Sittman and Pitt Company had sophisticated slots design of five drums of the same size holding the total amount of fifty different card faces and was mainly poker based. The machine became popular very fast. Very soon a lot of bars all around the city managed to acquire one or more machines for clientele attraction. The players willing to gamble at first slots only had to insert a nickel into the slots and push the lever. This would spin the drums with the poker card faces, and players were praying for the winnings. The most significant was the fact that there were no direct payout mechanisms at first. Thus, for example the pair of lower value cards on the drums could give the gambler the chance to drink free beer, when royal flush, for instance, might pay the cigars or drinks. All the prizes were dependable on the establishment's assortment. In order to make the odds more convenient for the house, 2 cards were purposely removed from the deck. In such a way ten of spades alongside jack of hearts that could double the player's odds were removed to prevent winning over the house. By the way, the spinning drums could also be easily removed in order to decrease the winnings of the player.